A long time ago, I developed a game for another publisher that included helicopter units. I liked the helicopter units – their ability to fly anywhere and alter the situation made the game very different from the World War II games it otherwise resembled – and when I became a game publisher I began to include them in games. I’m not sure why; I’ve always been deeply afraid of those whirring blades. But I’ve put them in Panzer Grenadier and Second World War at Sea games, but never on the scale of Second Great War at Sea: The Cruel Sea. The Second Great War setting includes all of the technologies familiar to our own world, but they’ve not developed at the same rate. Airships dominate the skies, while fixed-wing aircraft are less capable, their development about a decade behind the 1940 of our own world. Helicopters, in contrast, are about a decade ahead. While “alternative history” is sometimes taken as a license to “make stuff up,” I didn’t want to do that with The Cruel Sea. All of the aircraft are based on real planes and helicopters that flew, or were at least drafted on the drawing board. In the case of the helicopters, all of them are craft that were actually produced and flew, they just do it somewhat earlier in our story. The Cruel Sea is packed with helicopters. Each of the participants – Imperial Germany, Republican France and Imperial Russia – brings helicopters to the game table (two Russian models, two German models plus one autogyro, one French helicopter). Let’s start with a look at the Russian helicopters. In The Cruel Sea the Russians have a pair of large helicopter carriers plus four hybrid coast-defense ships with a large helicopter flight deck aft. That allows them to bring a great many helicopters to sea, for anti-submarine work or to shuttle the elite special landing forces onto hostile shores. 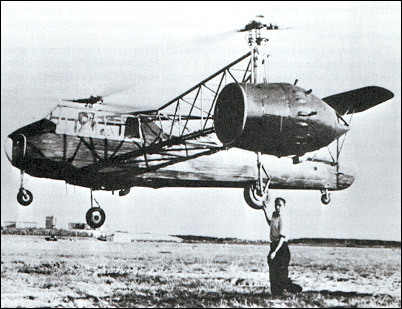 In our very own reality, the Ivan Pavlovich Bratukhin’s OKB-3 Design Bureau began work on a two-engine, traverse-rotor (that is, two rotors extended from the aircraft’s body on wing-like extensions) helicopter initially known as the Omega, or G1. The Omega, authorized in June 1940, carried a crew of two (pilot and observer) and began tethered tests in August 1941. Those were interrupted in October when the bureau had to flee Moscow for Central Asia, and resumed the next spring. The helicopter showed promise, but its engines overheated far too readily. The Omega II, or G2, had improved engines, streamlined engine pods and better gearing. It managed to fly independent of its tether in September 1944, only to be damaged in a January 1945 landing. Given the good results, the Red Air Force ordered 10 models of a G-3 artillery spotting machine, equipped with imported Pratt & Whitney engines, but only one was actually produced in 1945 beyond the two prototypes and it had to be devoted to train helicopter pilots. More prototypes appeared through the rest of the 1940’s, steadily enlarging the machine and adding improvements to the engines and drive assembly, apparently a weak point in the design. The wing stubs would be covered in fabric and canted to help provide lift and stronger struts fashioned from light-weight alloys. The enlarged ninth version was an air ambulance, able to carry four stretchers (in two layers) with an attendant; the tenth had two additional crew positions, each equipped with a machine gun. The eleventh version appeared in April 1948 and initially performed very well, showing markedly reduced vibration and an ability to fly on one engine. But the right-hand engine had a tendency to seize up, and in a December 1948 it threw a rotor which smashed into the fuselage and killed both test pilots. Bratukhin built a new model with better rotors, but the engine seized up again. In May 1950 he made the final improvement, new rotor blades, but by this point a cloud of failure stemming from the fatal accident lay over the project. The OKB-3 Design Bureau shut down and emphasis went instead to promising single-rotor designs from Mil and Yakovlev. 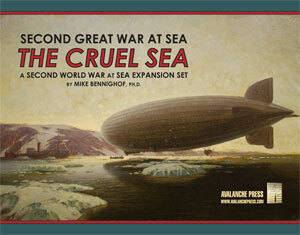 In The Cruel Sea, we’ve let the development take place a decade earlier and progress beyond the eleventh model. The G2 represents an enlarged version that can carry more passengers or ordnance, making it the Russian Navy’s workhorse troop carrier and anti-submarine helicopter. It also has a limited anti-ship capability. 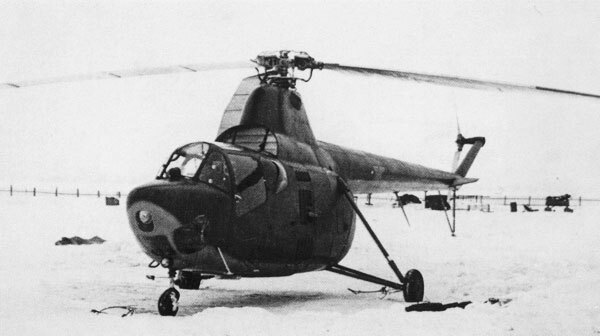 In contrast to the abandoned Brakhutin machine, the first Soviet helicopter put into full series production, the Mil Mi-1, would be produced in mass, with over 2,500 machines built over the course of 15 years. Mikhail Mil began designing autogyros in the 1930’s, but his work was interrupted in 1941 when he was drafted into the Red Army of Workers and Peasants and thrown into the brutal close-quarters infantry fighting at Yelnya. Mil survived and in 1943 was released from service to resume his studies. Mil received his doctorate in 1945 and two years later was head of the new Moscow Helicopter Plant’s design bureau, known as OKB-4. Mil’s team developed a small, single-rotor helicopter with a simplified and very efficient rotor hub. The craft made its first flight in September 1948, and while the first test proved successful both of the early prototypes crashed. Even so, limited production was authorized and 15 machines built in 1950. The next year one was presented to Josef Stalin, who ordered it into mass production. By 1954 large numbers were rolling off the assembly lines, finally stopping in 1960 in the Soviet Union with licensed production in Poland ending in 1965. The Mi-1 was a small general-purpose helicopter with a crew of three or four depending on the variant. Capsules to carry wounded on stretchers could be fitted to either side. A prototype armed with anti-tank rockets appeared in 1961, the Soviet Union’s first attack helicopter, but did not go into production. In The Cruel Sea, the Mi-1 has no armament (none that shows up in game terms, at least) and provides an anti-submarine capability to the helicopter carriers and coast-defense ships. It’s also the helicopter that serves on most Russian capital ships as its integral aircraft (that’s an Mi-1 silhouette on the Russian battleship and heavy cruiser pieces). And those are the Russian helicopters of The Cruel Sea. Next time we’ll look at the Germans.